Boží Dar lies on the boarders with Germany below the highest peak of Krušné Hory – Klínovec. 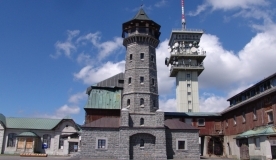 Boží Dar is an important summer and winter tourist centre of the Ore Mountains. Tourists come here mainly because of ideal conditions for winter and summer vacation. They will find here several ski slopes, tens of kilometres of cross-country trails, trails of various difficulty for cyclists and hikers. Nature educational trails, several museums and some monuments will motivate you to explore. In case of bad weather, a sports hall, indoor swimming pools and other activities open up. Spend an active holiday in the Ore Mountains, come to spend your vacation in Boží Dar. The town Boží Dar wishes to seek and purposefully develop all activities aiming at satisfying visitors´ demands so that they come back and stay longer. Selected information published by the City Council Boží Dar. More information on the website of the City Council.